On Arts Advocacy Day, February 19, VocalEssence staff members gathered with like-minded art lovers and shared with legislators the importance of the arts to our lives, communities and economy. Senator Bill Weber from southwestern Minnesota was one of many legislators visited by arts advocates including Katrina Wallmeyer, director of development and communications at VocalEssence, pictured with the senator. Each year, Minnesota Citizens for the Arts, which works to increase arts funding, organizes a rally at the Minnesota History Center Auditorium in St. Paul in the morning; the group then breaks into teams with experienced leaders and visits legislator offices to educate them about the arts in their communities and to seek their support for arts funding. 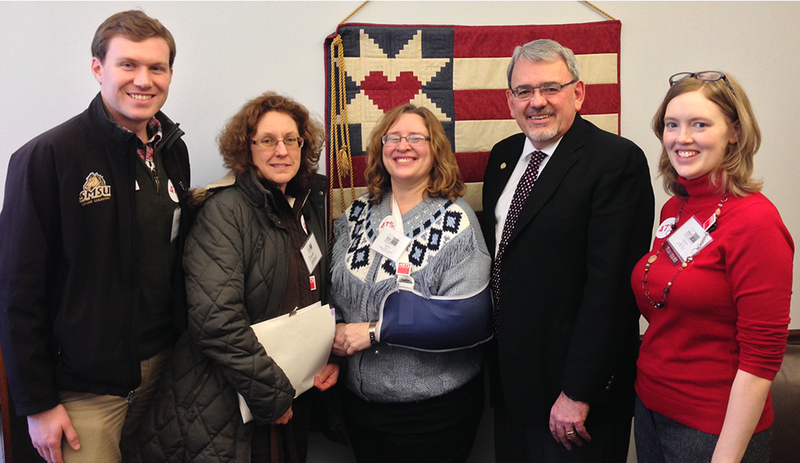 You can read more about Arts Advocacy Day and plan to join us next year. VocalEssence has a long history of advocating for the choral arts: We foster emerging high school talent through our apprentice programs and recognize choral leaders in our school communities with awards for groundbreaking work. Our staff members serve in leadership roles in Minnesota Citizens for the Arts, and VocalEssence supports emerging composers by commissioning and premiering new works. Now we have partnered with other Minnesota nonprofit and not-for-profit organizations in Music Makes Us Whole, an initiative that advocates for rich music education “because of music’s intrinsic value in the human experience, and also for the whole-brain and whole-life benefits to the child as well as his or her community.” The website launched early in January and is full of information and resources to help individuals and organizations make their voices heard, including a school locator, email templates and phone scripts. From the effects of music training on complex math and abstract-thinking skills to more qualitative values, music education is essential. Visit Music Makes Us Whole and voice your support for music education.